Published as: J. Wenisch et al., Phys. Rev. Lett. 99, 077201 (2007). Controlling the magnetic properties of semiconducting materials is certainly one of the key issues in the field of modern electronic device technology. An important material system in this context is (Ga,Mn)As, which has been the focus of many studies over the last years. As the understanding of its complex transport and magnetic properties increases, the focus of interest shifts from basic research towards its application in devices. For this, it is necessary to obtain a fundamental understanding of the nexus of magnetic properties and the structure of the materials at the device level. 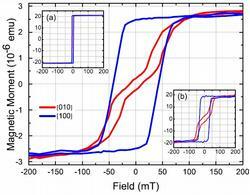 We present a systematic study of the role of strain relaxation in patterned (Ga,Mn)As nanostructures as the dominating factor contributing to the magnetic anisotropy. Before patterning, a (Ga,Mn)As layer shows biaxial easy axes along  and . We then produce narrow stripes by lithographically structuring the layer. This allows a large elastic strain relaxation (verified by reciprocal space mapping) in only one direction which replaces the corresponding easy axes by a hard axis. A (now uniaxial) easy axis remains in the other direction where pseudomorphic conditions are retained. The method allows us to locally control the magnetic properties of the material by influencing the strain anisotropy in the layer. FIG. 1: (a) SEM picture of the sample surface after patterning. (b) Simulation of the lattice displacement (100 times exaggerated) after strain relaxation in a cross-section of a 200 nm wide stripe. A (Ga,Mn)As layer grown epitaxially on a GaAs substrate is subject to compressive strain in the plane of the sample as the bulk lattice constant of (Ga,Mn)As is larger than that of GaAs. At temperatures around 4 K, the material typically exhibits preferred magnetization directions (easy axes) along the in-plane  and  crystal directions [1, 2]. In our experiment, we modify the lattice strain of (Ga,Mn)As on GaAs by lithography, which allows us to locally control the magnetic anisotropy of the material. To achieve this, a fully pseudomorphic 70 nm (Ga,Mn)As layer is structured into narrow but very long stripes (200 nm x 100 µm). By this, we allow anisotropic, elastic strain relaxation perpendicular to the long axis of the stripe. This uniaxial strain relaxation in the structures is investigated by sophisticated X-ray diffraction methods. 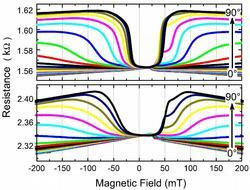 To determine the influence of patterning on the magnetic anisotropy, a series of magnetometric and magnetotransport studies are performed. After growth of the samples in a III-V molecular-beam-epitaxy chamber, electron beam lithography and chemically assisted ion beam etching are used to pattern the samples into the structure shown in Fig. 1a. By this process, a total area of 4 x 4 mm is covered with arrays of stripes, aligned along the  crystal direction, each individual stripe measuring nominally 200 nm x 100 µm with a separating distance of 200 nm. The etch depth is about 200 nm, extending well into the GaAs buffer. The patterning results in a nearly full relaxation of the strain perpendicular to the stripes, as modeled by finite element simulations displayed in Fig. 1b. FIG. 2: Reciprocal space h-k-maps in the vicinity of the (333) Bragg reflection at (a) a stripes-sensitive and (b) a bulk-sensitive l-position. In (c) the corresponding k-line scans (horizontal scans through the maximum of (a) and (b)) and best fitting Voigt-profiles are shown, see text. The actual strain relaxation in the (Ga,Mn)As stripes is determined by measuring the lattice constants along selected crystal directions by reciprocal space mapping in the vicinity of the (333) Bragg reflection. These grazing incidence X-ray diffraction (GIXRD) measurements have been performed at beamline BW2 of HASYLAB. Experimental complications arise from the fact that (due to the small lattice mismatch of f = 1.5•10−3) the Bragg reflections of (Ga,Mn)As and GaAs are separated by only ∆l = 0.0044 r.l.u. (reciprocal lattice units) for the purely pseudomorphically strained case, a value which can hardy be resolved by our experimental setup. However, the small thickness of the (Ga,Mn)As layer (70 nm) leads to a significant broadening of the (333) reflection in l-direction as well as the appearance of finite thickness fringes. By mapping the reciprocal space on the maximum of one of the finite thickness fringes, the measurement is mainly sensitive to the (Ga,Mn)As stripes, as well as sufficiently far from the l-position of the GaAs bulk peak. Fig. 2a shows the pertinent h-k-map at l = 2.98, and a similar map through the GaAs (333) bulk-peak in Fig. 2b. 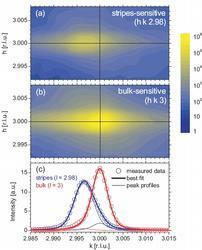 We observe a clear shift of the (Ga,Mn)As-sensitive peak towards smaller values in k (Fig. 2a). This shift indicates relaxation of the (Ga,Mn)As structure in  direction, whereas in  direction no relaxation takes place (no peak shift is visible in h-direction or in the bulk-sensitive measurement). To extract quantitative data on the shift from the experiment, we fit Voigt-profiles to the measured peaks. Fig. 2c shows the central line scan through the peaks of both reciprocal space maps (open circles in the figure). Each curve is fit with the sum of two Voigt-peaks (thick solid lines), one fixed at h = 3 representing the bulk-contribution, the other with a variable position. All four individual peaks are also shown as thin lines. By this procedure we obtain a value for the strain in  direction of ε = (as − ar )/ar = −2.8 • 10−4 , where as (ar ), is the lattice constant of strained (fully biaxially relaxed) (Ga,Mn)As, respectively. We conclude that the (Ga,Mn)As stripes are pseudomorphically strained along  but show a large degree of strain relaxation in the  direction. Magnetic characterization was performed by using a superconducting quantum interference device (SQUID) to measure the magnetization behavior in the parent and patterned layers. The parent layer (inset (a) of Fig. 3) exhibits the well known [1, 2] biaxial anisotropy at 4 K, with easy axes loops along the  and  crystal directions and hard axes along  and . The two easy axes are both plotted in the inset (indistinguishable in this graph). Fig. 3 shows the anisotropy after patterning. Along the  direction, the magnetic moment at zero field drops by ∼ 90% compared to the  direction. 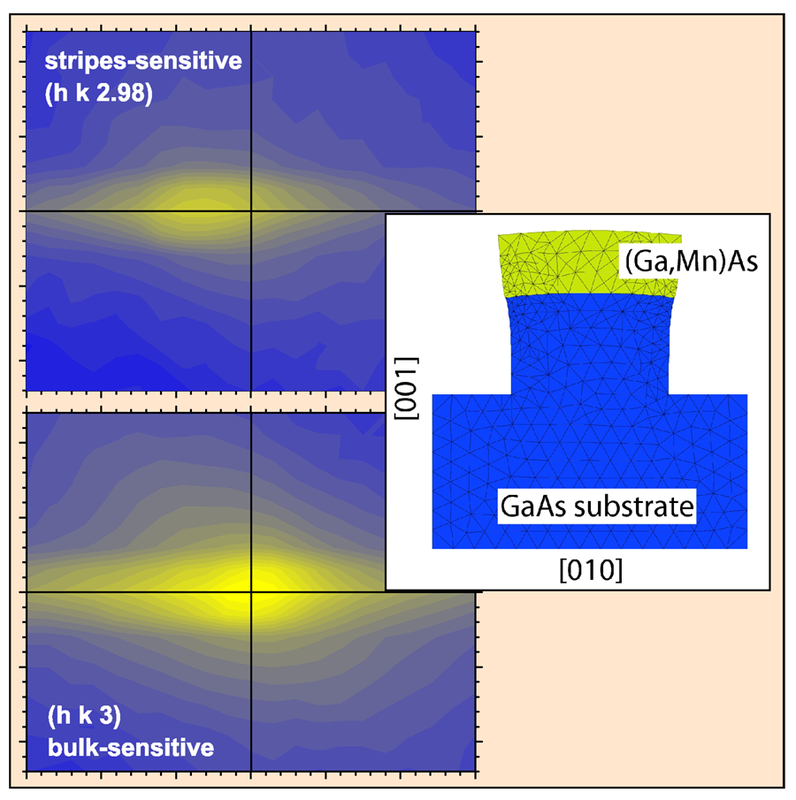 This previously easy axis is now clearly a very hard magnetization axis, showing a clear modification of the magnetic anisotropy of nanopatterned (Ga,Mn)As/GaAs stripes. FIG. 3: SQUID magnetization data at 4 K for the parent layer (inset (a)) and the patterned layer, stripes aligned along . Inset (b) shows the patterned layer data for an additionally strained stripe structure (see text). To study the dependence of the induced uniaxial anisotropy on the magnitude of strain in the structure, we use a 80 nm (In,Ga)As layer with considerably larger lattice mismatch to the substrate, deposited prior to the (Ga,Mn)As layer. Magnetically, this sample shows a similar behavior as the (Ga,Mn)As sample with a GaAs buffer layer, see Fig. 3, inset (b). 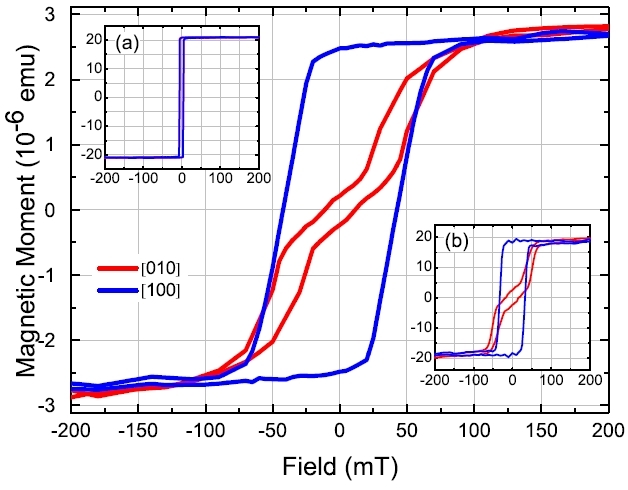 We find that the imposed uniaxial anisotropy in the sample containing the (In,Ga)As layer stressor is stronger than in the first sample, which becomes obvious in magnetoresistance measurements. In (Ga,Mn)As, a strong anisotropic magnetoresistance (AMR) is generally observed, such that a minimal resistance is achieved if the magnetic moments of the material are aligned parallel to the path of the current passing through the structure . As with the SQUID results, the measurements (see Fig. 4) fit perfectly into the picture of a strain-induced uniaxial magnetic anisotropy. We observe a larger opening of the curves from the additionally (In,Ga)As-strained stripes (lower part of Fig. 4). This is a direct evidence of an increased uniaxial anisotropy term, as more energy is necessary to rotate the magnetization into the unfavorable hard  direction . Finally, k •p calculations  of the magnetization-direction dependence of the mean energy per hole are in excellent agreement with experiment and support our interpretation that strain is the key element in determining the magnetic anisotropy in (Ga,Mn)As nanostructures. FIG. 4: Magnetoresistance scans of (Ga,Mn)As/GaAs (top) and (Ga,Mn)As/(In,Ga)As/GaAs stripes (bottom) at 4 K for angles φ between magnetic field and current direction (along stripe) from 0◦ to 90◦ . The magnetic field is swept from −0.3 T to 0.3 T for each scan. 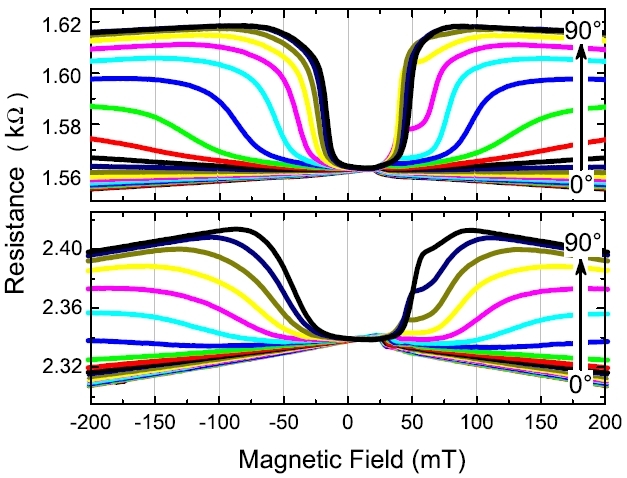 We conclude that synchrotron X-ray diffraction and magnetic studies demonstrate that lithographic pattering is a reliable and versatile tool for controlling the magnetic anisotropies in (Ga,Mn)As. 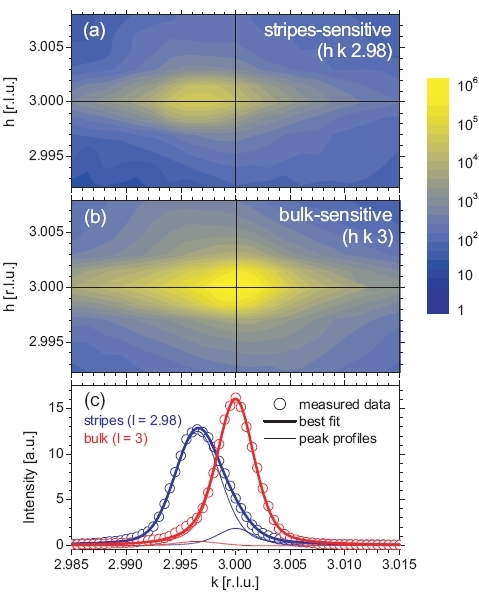 We emphasize that this new source of anisotropy arises from the deformation of the crystal structure during relaxation and the strong spin-orbit coupling which links the magnetic properties to the crystal. As such, it is fully distinct from shape or any other form of anisotropy known in metallic ferromagnets. We propose that this technique of local, lithographic engineering of magnetism in (Ga,Mn)As nanostructures proves very useful for realizing novel spintronic memory and logic devices . We thank T. Borzenko, A. Stahl and I. Gierz for their help in this work. We acknowledge financial support from the DFG (BR 1960/2-2 and SFB 410) and the EU (NANOSPIN FP6-IST-015728 and the IHP programme “Access to Research Infrastructures“).